The family resort par excellence (« Family Plus Mountain» certificate), Châtel is in one of the world’s biggest and most prestigious ski areas: The Portes du Soleil. No less than 650 km of Franco-Swiss pistes enable you to cover the 12 resorts in this cross-border area: Châtel, Avoriaz, Morzine, Les Gets, Saint-Jean d'Aulps, Montbriond, Abondance, La Chapelle d'Abondance, on the French side and Morgins, Torgon, Champoussin, les Crosets and Champéry, on the Swiss side. Since the building of its reservoir (the biggest high altitude dam in France), Châtel is capable of producing quality artificial snow to ensure optimal snow coverage for you during your winter holiday. The village of Châtel is vital and lively all year round and provides suitable cultural and sporting events in all seasons. 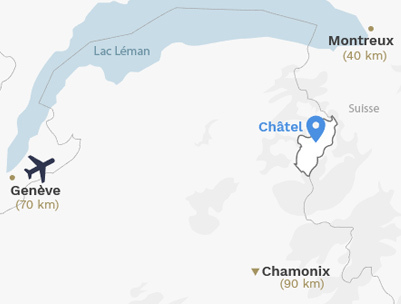 By purchasing your apartment in Châtel, you are opting for a well-considered location in the heart of an exceptional ski area. By purchasing your MGM apartment in Châtel, you are choosing the quality of a top of the range property combined with stunning surroundings. With its authentic mountain architecture, the village of Châtel combines character and elegance. Its architecture, classified as «Area of Art and History», is notable for its strong identity and preserved tradition. The oldest chalets date from the 16th century and are built of local materials: stone, slate and wood. Abondance is the essential local cheese and a must try, either in the course of a meal in a restaurant or, for the more enquiring, on a visit to a farm to discover for yourself local production and produce. Châtel opens the Portes du Soleil for you and the essential pleasures to be savoured with passion!